The International Guide to Greater Indianapolis provides visitors or newcomers from outside the United States with immediate needs and daily life, living and working information. The Guide provides detailed information about many topics that newcomers are very unfamiliar with in their native countries. Information ranges from bank and financial to postage and clothing size conversion charts, utilities and transportation to education, communication and media, employment, government, religion, social services and taxes. 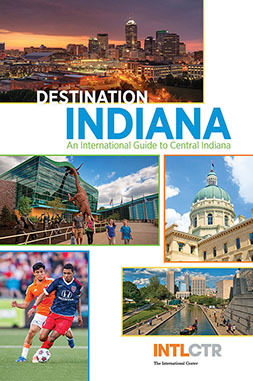 The International Guide to Greater Indianapolis is the result of dedicated effort by Christine Dowdeswell and Janet Fischer, cross-cultural experts who have first-hand experience with the difficulties newcomers face, particularly arriving for the first time experience living in the U.S. and Indiana.